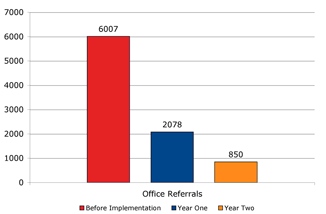 "In one year�s time, we went from 6,007 referrals to 2,078, and at the end of the second year, the total number of referrals was 850—an 85 percent reduction in two years� time. Although the numbers are impressive, they are not the only measure of success. Implementing our schoolwide discipline process changed the climate from tense and edgy to safe and welcoming." Read more about the transformation of McLoughlin Middle School in the September 2005 issue of Principal Leadership. Check out our Safe & Civil Schools in Print page to select this article from a list of articles from and about Safe & Civil Schools.